According to the department of homeland security, port security refers to defending and enforcing laws and treaties and combating terror activities that lie within the maritime and port domains (Christopher, n.d.). The collaboration of port security and enforcement operations is mainly done on an international level. It involves the protection of seaports, activities taking place at the port have to be protected, and this include the inspection of cargo and other maritime activities. The operations and the rules governing the collaboration are mainly formulated and issued by the international maritime organization. There is a security code known as the international ship and port facility code. The code oversees the operation of the port and the activities that accompany the operations of the port. As such, there are certain challenges that arise in the management of the port and the entire collaboration. Major challenges that can be cited include the global de-factor programs that were formulated in the United States and adopted for use in the ports around the world. The trading partnership against terrorism and the container security initiative can be seen as some of these challenges. The failure of a coordinated collaboration of these activities in ports around the world poses a threat to the security of ports not only in the United States, but also around the world. If these challenges are not resolved promptly, some security threats are imminent among which include dirty bombs. A dirty bomb is a radiological weapon that is deployed with the aim of contaminating the area with radioactive material (Frittelli, 2008). The result is the exclusion of the area affected by the bomb from civilian inhabitation. The bomb makes use of conventional explosives to produce a blast that is lethal to individuals and a following hazardous environment not fit for living. The 2012 DNI threat assessment details a number of priorities that details the nation’s tactical and strategic response against terrorism. The main security concerns include counterterrorism, cybersecurity, counter proliferation and counterintelligence. The director of national intelligence incorporates the major threats that are prominent in the United States in these four major categories. The classification enhances the classification of the threats facing the country from al-Qaida to cyber threats that is an evolving strategic concern. Christopher, K. Port security management (1st ed.). Frittelli, J. (2008). 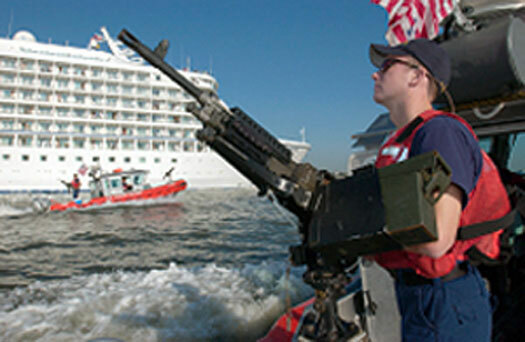 Port and maritime security: background and issues for Congress. Port And Maritime Security, 11.